Caught in a bad hotel..
OK, so we look kind of silly in the white pajamas, but our contingent organizer looks freeking fierce! A loose affiliation of radical street musicians. The BLO has helped support a large number of actions and issues in the SF bay area over the last several years. Including helping to shutdown the SF financial district during the protests at the beginning of the Iraq war. Since I don’t actually play a horn, I started out playing snare and now a very large surdo. But I’m kind of a “band member at large” as I’m often not in the bay area. The BLO plays a strange mix of music, but lots of influence from various balkan brass bands and creative arrangements of political music from different ages and movements. There is more information, sheet music, etc on the website. There seems to be increasing numbers of bands like this in the US, which I find very exciting. 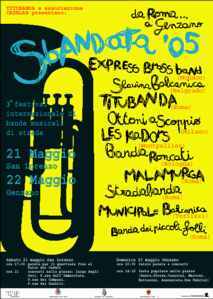 Were are beginning to join the international sisterhood of radical brass bands. 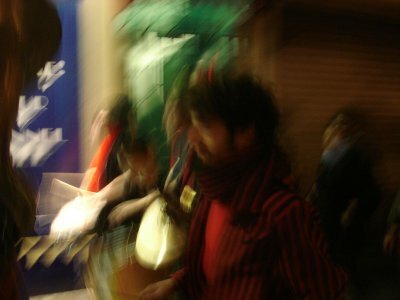 Groups like the now disbanded Infernal Noise Brigade from seattle, the Hungry March Band and Rude Mechanical Orchestra from NYC. There is now a US email list for interested street band folk, and hopefully this fall we will have the first sbandata-style party (sbandapaloza?) in the form of the HONK festival in Boston.